Portugal is one of the few remaining European countries that still operates functional produce markets – markets where locals actually buy their shopping, as opposed to the more expensive weekend “farmer’s markets” that are common in the UK and USA. If you’re visiting the Algarve, and especially if you’re staying in self-catering accommodation, then a trip to one of the many Algarve markets is an absolute must. Here, you’ll be able to buy fruit and vegetables, meat, fish, as well as other local produce like cheese, cured meats, and bread. Although you’ll be able to get a lot of these things at the supermarket, the quality tends to be much better and cheaper at the market. 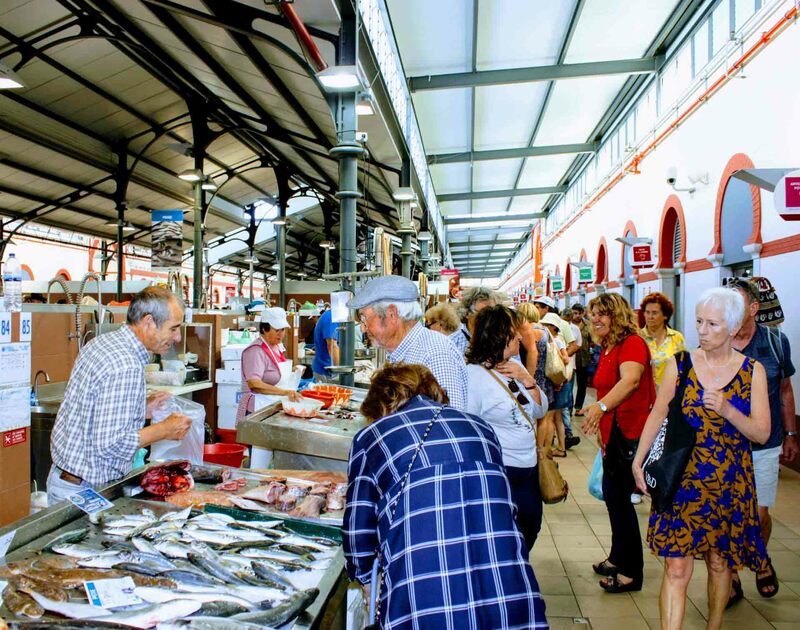 In this article, you can view markets in the Algarve by day (if you’re looking for a market that’s on today, for example) or by town (so that you can see when your nearest market is on). If you’re visiting Lisbon, be sure to check out the guide to markets in Lisbon. We’ve put together a handy map of the Algarve’s markets, so you can see at a glance which ones are closest to you. Pink logos: are a combination of both. Monte Gordo: 4th Saturday of the month from 10am. Olhão: Takes place every day with a larger market (including a gypsy market) on Saturday mornings. Burgau: The nearest market is in Lagos. Feragudo: Does not have a market. The nearest market is in Portimão. Lagos: Weekly Saturday Farmers Market (8 am – 2 pm) with a more general market on the 1st Saturday of the month. Markets also take place on the 1st Sunday of the month. Portimão: 1st Monday of each month (8 am – 2 pm) & the 1st and 3rd Sunday of each month. A number of local tour companies now operate market tours of a number of different Algarve markets, particularly Quarteira Market and Loulé Market. This is often an excursion that’s provided by a cruise company or all-inclusive resort. The markets are safe and, aside from maybe the range of fish, the produce isn’t that different to what you might encounter back home. That said, some people prefer a guided tour and there are now several companies offering just that. Fish and seafood are a big part of the Portuguese diet, and most of the markets have an excellent selection of fish – better than what many visitors are used to anyway. Olhão is home to the best fish market in the Algarve but many others, like Portimão, don’t lag far behind. Almost all of the markets have an excellent selection of fruit and vegetables, most of which is grown locally or at least in Portugal. Look out for sweet potatoes (batata doce) for Aljezur, something which the Algarve is famous for. You’ll also spot some interesting seasonal fruits like dióspiros (the Hachiya persimmon), which is absolutely delicious and tastes like honey. The Portuguese eat a lot of chicken, often BBQ’d, and you can usually find really well-fed and good quality chickens at the market. The prices are very reasonable as well. Pork is also very popular. Look out for Porco Preto, which is the Black Iberian Pig. It’s very flavoursome, and something you’ll only find in Spain and Portugal. Beef in Portugal usually isn’t very good quality, especially when compared to beef from other countries like Ireland, the UK, or USA. Other more unique things to look out for are cabrito (kid goat), leitão (suckling pig), and cured meats like presunto. Am I wrong, but Sao Bras de Alportel flea market, is every 3rd Sunday !!! !